As Boulder joined 4500 locations worldwide rallying in a “Day of Climate Action” organized by 350.org, the size of the downtown crowd Saturday, Oct. 24, appeared to number, coincidentally, about 350. The event begain with a morning bike ride by about 200 participants from downtown to the Valmont Power Plant on Arapahoe Ave., where they called for an end to coal-burning at the facility (which can also burn natural gas). 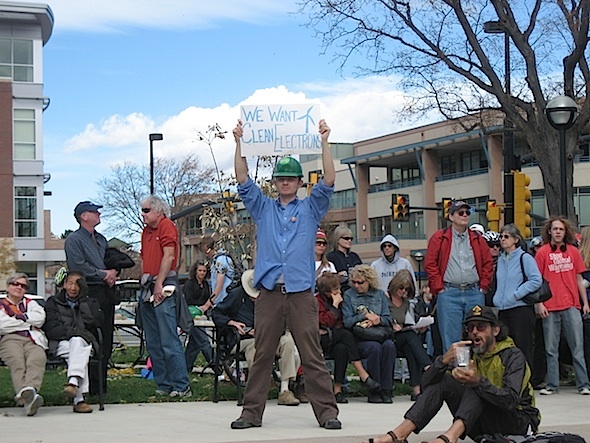 Then, at a downtown rally in front of the Municipal Building, speakers, including Rep. Jared Polis, called for strong action to resist further global climate change. Excerpts from several of the speakers can be seen on the accompanying video. — Chuck Kutschner of Golden-based National Renewal Energy Laboratory presented a succinct and powerful summary of the effects of CO2 atmospheric buildup (in a word, ominous). — Rep. Polis, our Democratic Congressman, was cool in his enthusiasm for climate-change legislation making its way through Congress; he seemed quite aware that it’s probably waaay short of what’s needed. As a hefty wind whipped at the American flag behind him, Rep. Polis lamented: “We’re up an orchestrated campaign of lies funded by the same interests that would keep us reliant on oil.” He then urged the mixed-age crowd to continue pressing officialdom for more meaningful action. — But easily the most militant comments came from Tom Weis, president of Wind Power Solutions in Boulder, who castigated all around — Xcel Energy, Governor Ritter and Congress — all of them for not doing enough or going far enough. It must be said that the local organizers, led by Micah Parkin, did a highly professional job of organizing the bike ride and the speaking event. The sound system was perfect, and emcee Clay Evans was poised, friendly and efficient. The enthusiasm of attendees was inspiring, cheering, maybe even tear-invoking. Many Boulderites know the lateness of the hour, and the uphill battle ahead. 350 Day Boulder from Ben Chambers on Vimeo.